Dylan is four months old! He is the happiest, cutest, sweetest little boy and he has been doing so well these last couple of months. He’s absolutely just a joy and I’m excited to share some updates on what’s been going on with him for the last couple of months since we last checked in. By the Numbers: Dylan is a tiny little peanut! 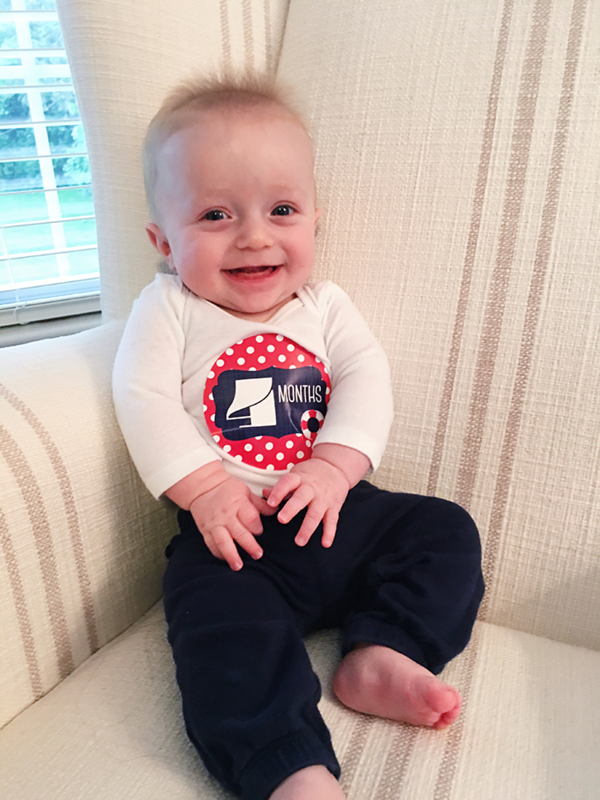 We had his four month appointment on Monday and he weighed a little over 12 lbs and was 24″ tall. He’s a little underweight so we’ve got to work on getting him a little chunkier (why don’t I have this problem?) and go back for a weight check in a couple of weeks. 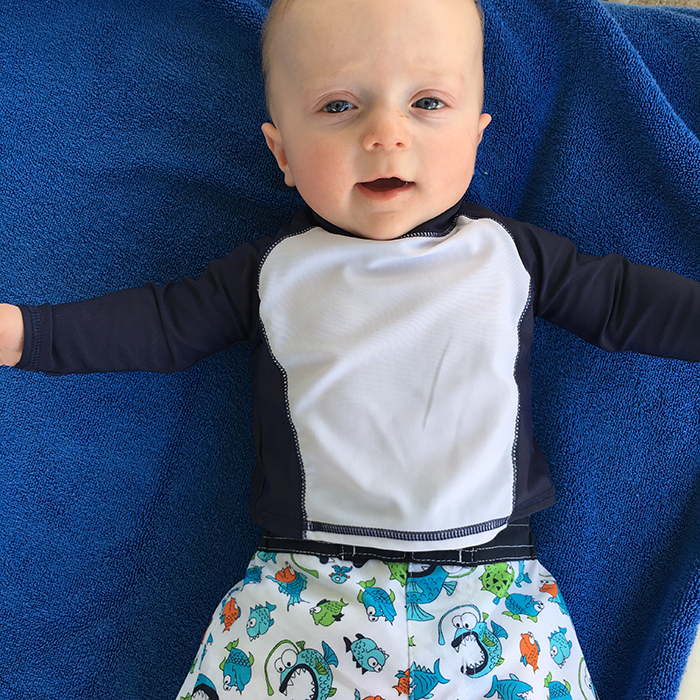 He’s comfortably wearing 0-3 size clothing and a few 3-6 month items (if they run small). Sleep: I hear there’s a four month sleep regression coming, but we’re fighting against that hard at our house! Truthfully, Jackson never went through that and he slept through the night consistently starting at 11 weeks old. Dylan has started sleeping awesome lately, and we’re getting 10 hour stretches from 7:30 PM – 5:30 AM. Typically we’ll give him a bottle at 5:30 and put him back to bed and he will sleep a few more hours. He also naps 2-3 times a day, and the length of those naps varies quite a bit. Sometimes it’s a 3 hour nap in the morning and then a 45 minute nap in the afternoon and sometimes its 3 45 minute naps throughout the day. I think the sleep success has really been because we’ve been super consistent on a routine, and it’s exactly what we did with Jackson as a baby. Starting at about 6:30 we do a bath, followed by a book and a bottle then bedtime, which ends up being around 7:30 every night. I’ll typically rock him for a few minutes after he finishes a bottle and then put him down and now we are at the point that he falls asleep right away most nights. To get to that point, we did do a little modified cry it out (where he’d fuss or cry for max. 5 minutes, then we’d go in and comfort him and put him back down) and that seemed to work well for him because now he can soothe himself back to sleep very easily. We’ve also been very patient with him and we don’t rush anything. If he needs to rock for a few extra minutes, we do that. If we need to make another small bottle, we do that. It’s whatever he needs and I think that our being patient and calm with bedtime has also helped him a lot. Eat: Eating is one of Dylan’s favorite things to do! We moved up to 6 ounce bottles last week and he downs them in a matter of minutes. About two weeks ago, we started rice cereal, as well. I called the pediatrician and just let them know that Dylan seemed to be needing more in the way of food, so they gave us the go ahead to start cereal. It’s been a sort of training process for him to learn how to eat, but that has gone great and he’s almost finishing his cereal when he gets it (which is once a day). We started other foods just this week and, so far, sweet potatoes are a hit. I enjoyed the process with Jackson of trying new food and I look forward to getting into more taste testing with Dylan too. Moving Around: This kid wants to run! 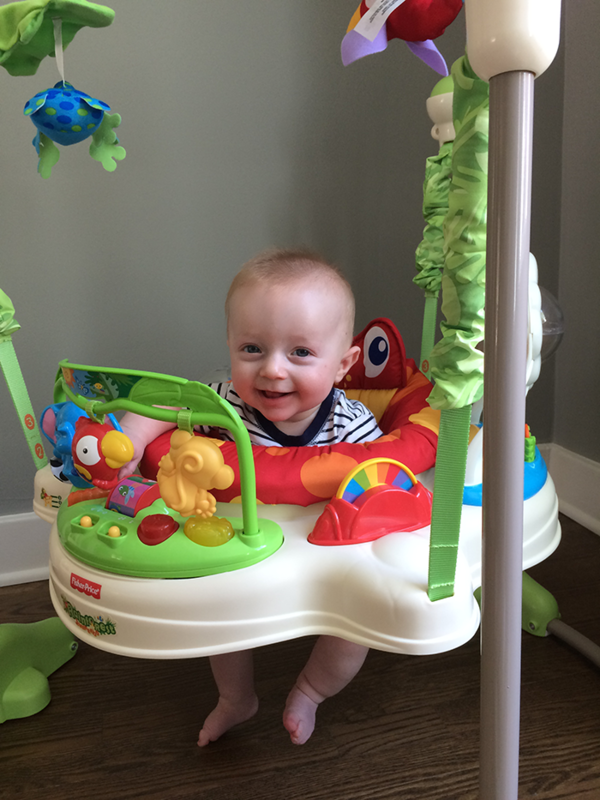 His favorite thing to do is stand up so we picked up this exersaucer with little places for water play for outside and this Fisher Price Rainforest Jumper for inside the house. He’s a big fan and loves being active. We also are still using this playmat, which is a big hit. 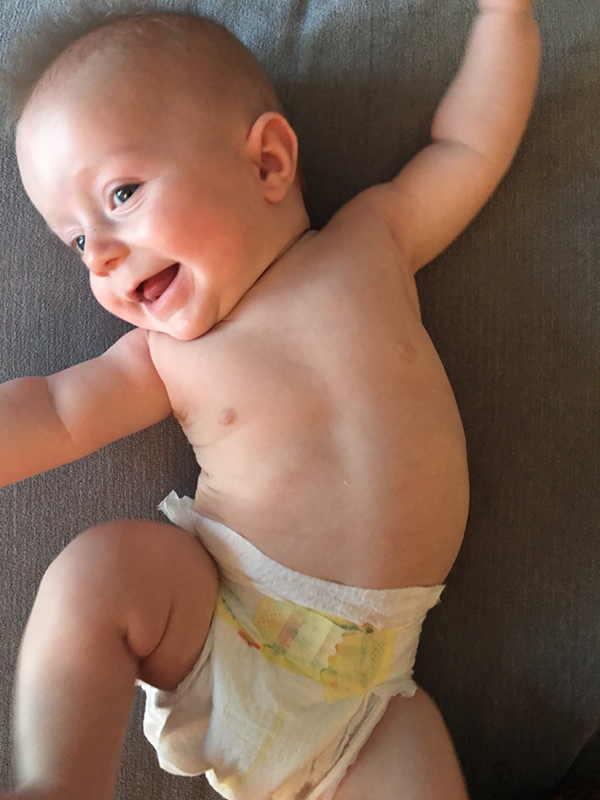 He can roll from his tummy to his back, both ways, and is working hard to go from back to tummy and I think we’ll get there any day now. 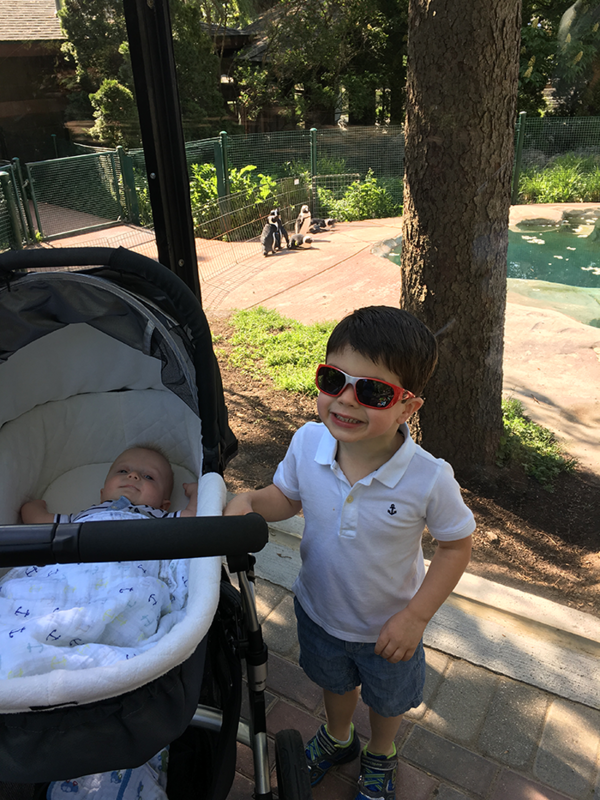 Loves: Dylan loves food, watching his big brother do absolutely anything, going for walks with mommy and getting to have time in just his diaper. He also still loves the water, especially his baths. We took our first trip to the pool recently and he loved floating around with us! What’s Jackson Doing? : Just when I thought Jackson couldn’t get busier, he got SO MUCH busier. He has been playing tee ball (but really more playing in the dirt) and continuing his gymnastics classes, and we start him in swim lessons again next week. Last year it took him all summer to be brave enough to jump off the diving board at the pool but this year he did it on our first time there. He’s getting bigger and smarter by the week! Jackson is still really loving his little brother. He can be very helpful and also likes to read Dylan a book before I put him to bed, which is adorable. While a lot of this “reading” is memorization, we’re actually very proud of him and his actual learning to read. He’ll point out words in books and on items around us, sound them out and read them to us all the time. He’ll start young 5’s in the fall and we (and his teacher) think he’ll be reading by the end of this calendar year!